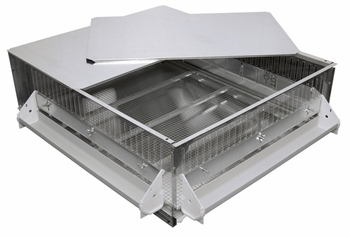 GQF Box Brooders are designed to eliminate stress in young birds by providing plenty of heat, fresh air, light, feed and water space, and sanitary conditions for a confined area. Three clear plastic panels allow full and easy viewing of the brooder’s interior. Each brooder comes with three 28.5' troughs which maybe used for either feed or water. Ample feed and water space is necessary to allow weaker chicks access in the presence of more dominant chicks. Any trough may be equipped with optional automatic watering to provide the large quantity of water necessary. Failure to provide proper feed and water space can result in slower weight gain and perhaps higher chick mortality. The troughs are mounted on the outside of the brooder so that the chicks do not mix droppings into the food or water. The 300-watt heater provides sufficient heat while the vented plastic side panels keep out drafts. As chicks are drawn to light rather than heat, each heater has a socket for a low wattage attraction light bulb, which helps to hold the chicks in the heated area. Each brooder comes with a thermometer and a wafer thermostat, which is accurate to 1 degree. The floor is a thin wire ½” mesh which will allow droppings to easily pass through. For small chicks like quail this floor requires that a layer of No 1628 DACB paper or paper towels be laid down on the wire for the first 4 to 7 days after which quail may stand on the ½” wire floor. Day old poultry and ducks can be placed directly on the wire. Drop pans are made of lightweight aluminum for long life. Drop pans can be easily pulled out even when brooders are stacked and the wire floor is heavy with birds. This box brooder is universal as each side panel comes with an adjustable gate to regulate openings for chick size. 32” X 38” X 12” Approx. Poultry Chick capacity - 100 chicks through 2 weeks. Shipped in 2 cartons. THIS ITEM MUST BE ORDERED SEPARATELY FROM ALL OTHER ITEMS SO THAT THE WEBSITE WILL CALCULATE THE PROPER SHIPPING CHARGES. IF YOU ORDER OTHER ITEMS IN THE SAME ORDER AS THIS ITEM, YOU WILL HAVE TO PAY MORE SHIPPING CHARGES THAN THE WEBSITE CALCULATES, THIS WILL SLOW DOWN YOUR SHIPMENT WHILE WE CONTACT YOU FOR PAYMENT. Grogel Plus B 100 dose Can be used in chick shipping boxes for nutrition during their trip, or in the brooder or even at the hatchery. For hatchlings to start off well they need prompt access to water and feed. The earlier access promotes more rapid development of the digestive tract and the immune system. In turn this results in improved livability and as much as 5% to 7% heavier bodyweights. GroGel Plus provides an easy means by which just-hatched chicks and poults can receive immediate nutrition and hydration. 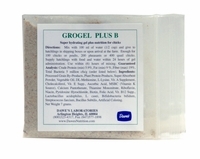 A unique formulation, GroGel Plus is tailored specifically for the limited amount a hatchling can eat, and for the immature nature of its digestive tract. In a soft palatable gel, GroGel Plus supplies crucial nutrients in the most concentrated, digestible forms: WATER is the largest single component of the hatchling�s body. Normally it is depleted during hatch and transport. Dehydration can lead to increased mortality, loss of bodyweight that is never completely recovered, slower rates of gain and depressed immune response. GroGel Plus supplies a substantial amount of water, giving birds a better chance to thrive. PROTEINS, PEPTIDES, and AMINO ACIDS are the main �building blocks� of most body tissues. GroGel Plus contains processed, complete proteins purified from several sources to supply a careful balance of peptides and amino acids. A practical amount of these purified proteins also is provided in partially digested form, to facilitate absorption. CARBOHYDRATES are the primary energy source in all poultry diets. The grains selected for GroGel Plus are processed to remove unnecessary fiber and other poorly digested fractions, and to improve the digestibility and concentration of the carbohydrates. FATS supply energy, and become parts of membrane and nerve tissue. They must be very digestible due to limited enzyme and bile production in very young birds. The fats in GroGel plus provide high levels of essential fatty acids in digestible form and are specially processed to be water-dispersible. VITAMINS are the catalysts that facilitate the work of all digestive, growth and immune processes. One dose of GroGel Plus exceeds all necessary vitamins for day-old hatchling. Additional consideration is given to those vitamins most effective at fighting stress and improving immune function. PROBIOTIC BACTERIA help establish normal gut bacterial populations. These bacteria help exclude many disease causing bacteria by competing for attachment sites and nutrients, producing antimicrobial substances, and stimulating the immune response. SUPER HYDRATING GEL provides the framework to carry the nutrients in GroGel Plus. Designed to attract the attention of hatchlings, the gel promotes immediate consumption. Don't let the critical first hours of life pass by without nourishing each vulnerable and valuable hatchling. GroGel Plus fights the clock, easily and effectively. THE SOONER THE BETTER!